This week for writing we made another explanation text but this time we new what to do completely and knew how to make it better. The text is still the same subject but has better information. I like the way that you put down your information in paragraph's. How long did it take you to gather all of this information? Hi Jack the Explanation that you wrote was amazing. I really liked the way how you wrote lots of explanation in each paragraphs. 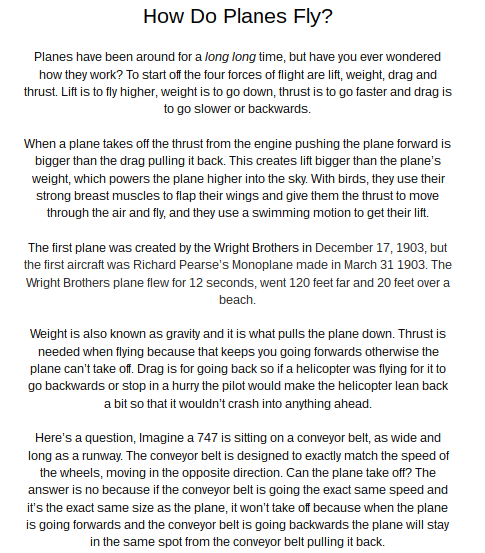 Hi Jack your explanation story about How Planes is really amazing and interesting. I like how you have the Title , Introduction , Explanation and the Conclusion. I really like your conclusion it is very fascinating. Great Job! Keep on working hard!